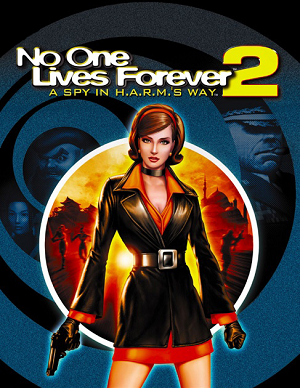 The official No One Lives Forever website has been shut down so you have to download the patches from a 3rd party. The fansite UnityHQ still host all the files needed to play online. The latest official patch is v1.3. The patch is available in the following languages: English, French, German, Italian, Spanish. 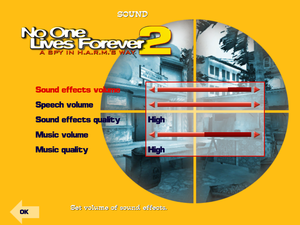 It can be downloaded from the Files section. Map Pack 1 - Official map pack. Map Pack 2 - Official map pack 2. Use No One Lives Forever 2 Widescreen Fix. Resolutions above 1920x1200 results in crash. 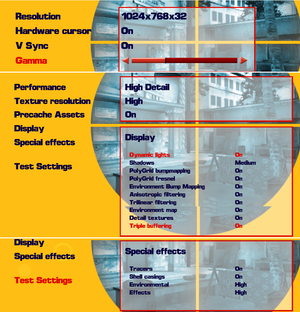 Level can be forced in the graphics card control panel. Click on "OK" and launch the game. The game has problem with music overlapping when guards enter search mode. On System32 folder, paste downloaded quartz.dll inside compressed archive. Confirm file replacement. The ingame mouse sensivity is too high. Add Lithtech.exe (root dir of game) to graphic-card-control-center and activate VSync.